With its clever rolled textiles, a family business in Spain has given traditional table linens a modern makeover by weaving the perfect blend of utility, style, and sustainability. Imagine the convenience of paper towels and the elegance of crisp cotton linens. Put the two together, and you’ve got MYdrap. These cloth serviettes are wrapped around a roll and perforated so that you can tear off individual cocktail napkins, luncheon napkins, dinner napkins, or placemats as needed. The MYdrap fabric is made from all natural fibers (100% cotton) that are biodegradable and recyclable. But before you think about tossing your used MYdrap linens, think again. All of these products can be washed and used over and over again. The company behind MYdrap was founded in Barcelona in 1925 by textile workers Antonio and Maria Guasch. When the family business created seamless cotton cloths on a roll for the hospitality market in the 1990s, the invention took the European textile industry by storm and helped Hostel Drap stay ahead of increasing competition from Asia. Now, the Guasch great-grandchildren -- Jacinto and Maria Guasch pictured here with Eva Ramirez -- have adapted the innovative rolled linens for home entertaining. When paper napkins just won’t cut it, but you’re not quite ready to break out your fanciest need-to-be-ironed linens either, MYdrap is the perfect solution. Hello, Daily Grommet. We at MYdrap are excited to be launching our internet presence here in the US via Daily Grommet, and we want to thank Daily Grommet for the opportunity to do so. MYdrap is a wide range of “cotton napkins on a roll” (actually, we have placemats, as well) that have 5 sizes -cocktail napkin, luncheon napkin, dinner, dinner premium and placemat - in many colors. This allows the consumer to have myriad possibilities to “colorize” their tabletops and present elegant, memorable settings. MYdrap is currently manufactured in Europe, where the market has embraced this high-quality unique product which we are delighted to bring “across the pond” and introduce today through Daily Grommet. LOVE THESE! But was really hoping to see a table runner option. Do they make these? Indeed, Table Runners are available. We can easily forward the information to DAILY GROMMET and they would be able to work with you!! Thanks for your comments. 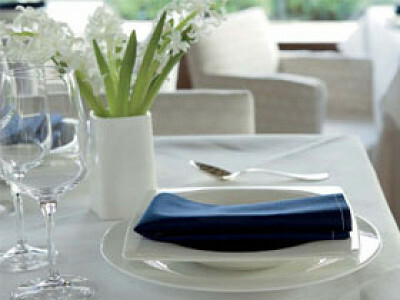 @Allen Uhler & @Liz - MYDrap is just getting set up here in the USA and the table runners are not available here yet. Daily Grommet has partnered with MYDrap as their first ecommerce partner and we'll keep you posted as we learn what's available and what our community and customers like and want. Keep the comments coming! I am confused -- are these napkins reusable?? @Allen Uhler: OK so they can be used and rewashed about 6 times and then you have to toss them? Ellen -- I wouldn't say you HAVE to toss them. They can still be used - cotton is great for cleaning and absorbing dust. We use them with the kids lunches, drying wine glasses (or any glass). @Ellen: I think the value here is if you're planning an event and you want to upgrade from disposable paper goods these are a great way to to do that. They're fun, beautiful and the decorating possibilities are endless. They come off the roll perfectly starched and impeccable. If you want to wash them you can but if you want to toss them they're economical enough that you can do that too. Allen - I love these. Thanks for the discovery Grommet. Question: When the napkins are washed do they need to be (or even can they be) ironed if removed immediately from the dryer? Thanks Drew -- good question -- now for the good answer : MYdrap is cotton and, just like any cotton, it does wrinkle and requires ironing OR immediate folding after the dryer. Personally I'm more of the hurry-after-the-drying-cycle kind of person. @liz - at the moment MYdrap is not offering a table runner. Great suggestion! The history of MYdrap disposable cotton napkins. I can't imagine the advantage to these. Sure, they are new, once, then once washed surely they need to be ironed? Basically this seems to be an option of more attractive disposables, rather like those handi-wipe cloths which you can wash & re-use. Maybe prettier but who are you fooling if they only look good once and then are going to need ironing? Then why not just buy good quality non-disposable cotton napkins? @Laura: I can see a variety of scenarios. Maybe you are hosting a larger luncheon where you don't want to invest in that many better quality cloth napkins. Maybe you like to update your linens and color schemes more often and don't want to commit to one color that will work throughout the years. Maybe you don't use fabric napkins very often and just want something fun that will last for a few occasions. If you do need to touch them up with an iron, that's the kind of ironing I don't mind; no pleats, armholes, or buttons to deal with! As with everything, this isn't a product that will work with everyone's lifestyles, but for those it does it's a great solution. I understand what you are writing, Laura. Katherine brought up some good points as well. The permutations relating to colors and sizes are important. Don't overlook getting one of your napkins stained, or lost or damaged, and then being short a total number for a dinner or lunch setting. We have demonstrated that ironed or products folded directly after drying are equally as presentable as "off the roll". However, it is a matter of personal taste and application......Thanks for taking the time to express your opinion, Laura. Will these look as crisp as the images after washing? @Cathy: We would have loved to have brought in all of the colors that MYdrap makes but needed to limit our initial offering to their most popular colorways. I will let you know if we bring in their more vibrant colors. @Katherine Klinger: I was so excited to see the bright green and purple in the picture, but alas...you aren't carrying them yet. I'm hosting a rehearsal dinner for my daughter and they'd be perfect! Good luck with these! @Cathy: We're offering 6 colors of 5 different sizes. Unfortunately, it was impossible for us to support every color with ample inventory. Perhaps we will be able to re-evaluate this after we learn how our community likes MYdrap. They do make many beautiful colors. Just this weekend I was having brunch at a restaurant in Paris (Le Quai) and noted the beautiful brown and apple green stripped table runners they used. I would love to see some printed options in order to add some life to an otherwise pretty standard table. Any idea when other option will be available? @Bibi: That sounds like a wonderful spot for a brunch. I will forward your note on to the MYdrap team. @Rose: No, they're not. Please read the full description and the comments. These are reusable and a much better option than pure disposable paper napkins. Considering that most Americans use paper and then toss them, this product is a good "bridge " between that and cloth. Thanks for bringing this product to the US-hope to see an expansion of the line soon! With its clever rolled textiles, a family business in Spain has given traditional table linens a modern makeover by weaving the perfect blend of utility, style, and sustainability. Imagine the convenience of paper towels and the elegance of crisp cotton linens. Put the two together, and you’ve got MYdrap. 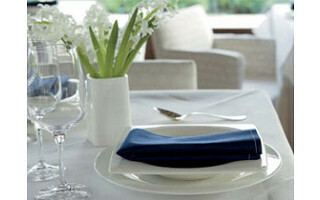 These cloth serviettes are wrapped around a roll and perforated so that you can tear off individual cocktail napkins, luncheon napkins, dinner napkins, or placemats as needed. The MYdrap fabric is made from all natural fibers (100% cotton) that are biodegradable and recyclable. But before you think about tossing your used MYdrap linens, think again. All of these products can be washed and used over and over again. The company behind MYdrap was founded in Barcelona in 1925 by textile workers Antonio and Maria Guasch. When the family business created seamless cotton cloths on a roll for the hospitality market in the 1990s, the invention took the European textile industry by storm and helped Hostel Drap stay ahead of increasing competition from Asia. Now, the Guasch great-grandchildren -- Jacinto and Maria Guasch pictured here with Eva Ramirez -- have adapted the innovative rolled linens for home entertaining.